Ideal to hold multiple cables 4’’W x 1’’H channel. 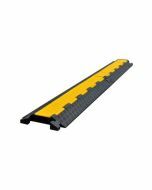 Our premium Cable Cover provides safely for pedestrians and important cables in high traffic areas. 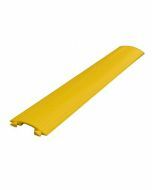 This product is made with a bright yellow color that improves visibility and helps prevent pedestrians from accidentally tripping over loose cables and is strong enough to protect cables from lightweight hand trucks and carts. It is ideal to be placed in warehouses, indoor work sites, offices, flea markets, house storages or garages, entertainment venues, shopping malls, the office, festivals, marinas, and many more places. 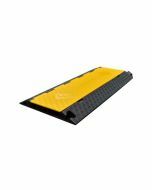 This cable cover is made with high quality industrial and heavy-duty molded polyurethane, just weights 5.2 lbs and support pedestrian traffic with weight up to 2,000 lbs per axle. Able to support lightweight vehicle traffic weighing up to 2,000 lbs per axle. Perfect cable protection for warehouses, indoor work sites, garages, offices and more.